Grace their presence for this delicate occasion with a touch of a mystical hued palette of fresh blossoming florals that brim with elegance, style, and classic refinement. 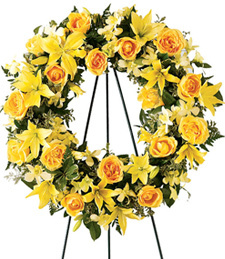 Making a lasting impression with a farewell tribute to a celebration of life. Forever and eternity is the call of unconditional love. 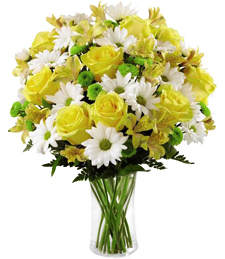 Ignite their senses with a pleasant aroma of blooming fresh florals in an invigorating shade of sunkissed yellow. Give them a bit of Rise and Shine to ease their grief and troubles in this difficult time. 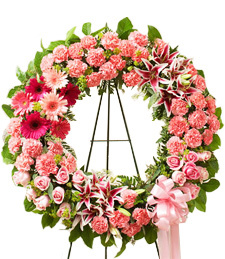 The creative display of a luxurious sympathy wreath to highlight that occasion is the ultimate gift of gratitude. 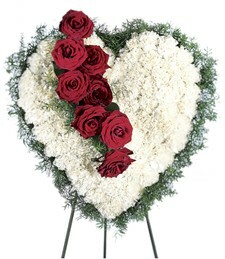 What a truly exquisite way to show your true affection and genuine friendship to that special someone in a time of need. 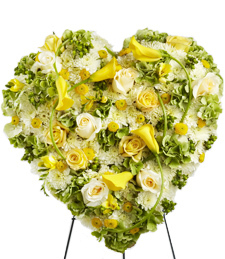 Sunkissed yellow and creamy white blossoms shimmer and shine upon that special someone like the light rays of heaven. 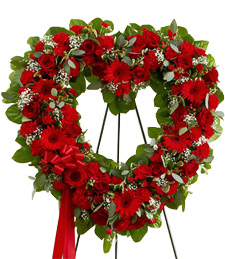 A simple heart wreath is the surest way to send them a glowing! There is nothing more profound than the colors of the heart. 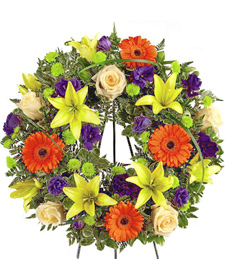 Send a Colorful Tribute to that special someone for a life well-served. 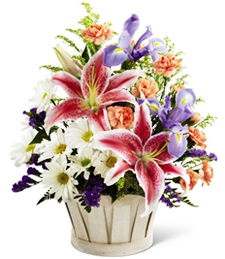 Dazzling fresh florals glow in radiant shades of energizing green, ravishing orange, sunkissed yellow, and deep purple to set that delicate occasion right. 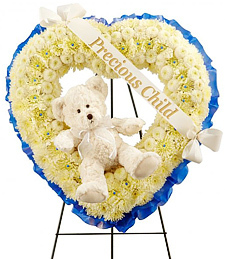 Commemorate together for a precious little life with your final farewell of a naturally beautiful sympathy wreath artistically designed of all white shimmering blossoms that set that occasion right. Add that precious little plush teddy bear for that extra feeling of warmth and comfort. Let their heart speak to you with a breathe of eternal life. 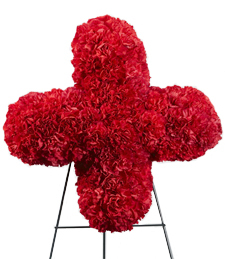 Red symbolizes true love and deepest affections. 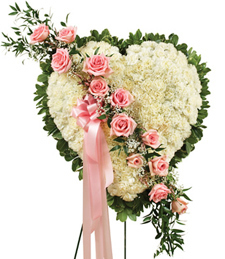 Show that special someone in a time of grief a part of your heart that can heal theirs with just a simple thought. Raise a toast to A Celebrated Life for every moment counts! 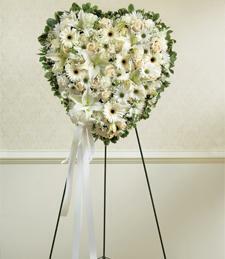 All white shimmering blooms come together in unison as soulmates meant to be. 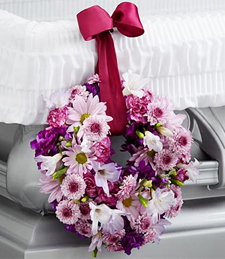 Stand together with that special someone as they pass through a state of grief and a new life ahead! 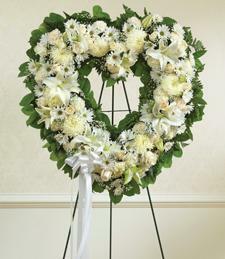 Lift your spirits to White Hearts Above for a life with an open heart is a gitfed choice. 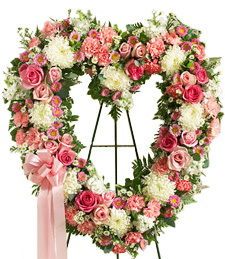 Make that unforgettable mark in their life with a token of heartfelt compassion and love. Come together in unison for every moment counts. Reflect at this difficult time with respect and compassion for a tasteful standing spray exudes passions and pleasures. Peace and Serenity is the theme of the moment for all suffering passes with time. 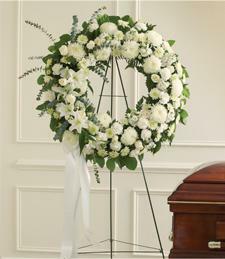 Shimmer and shine for a White Nights Standing Wreath is the perfect array of peace and serenity in a difficult time. 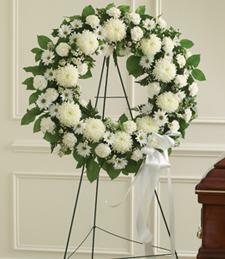 White luminous blossoms brim with class and style for every moment counts in the land of time. There is nothing greater in life than a beautiful heart for deep love and sincerest affections are the way to mend pain and sorrow. 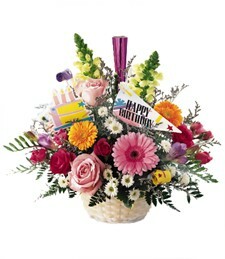 Shimmering pink blossoms brim with style and pleasure for a new life is not so for away. Be that shoulder of support during a difficult time of sorrow and loss. 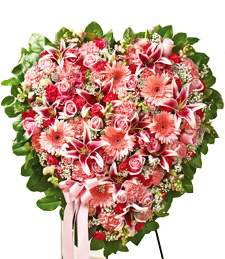 All pink blooms shimmer with grace and style for pink is the color of love and deepest affections. Serene tranquility is nothing short of A Peaceful Eternity. Peace, Love, and Prayers are the healing antidotes to mend a broken heart. 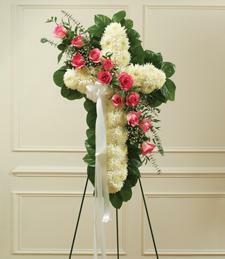 A cross-shaped wreath hand-designed with fresh white and precious pink blooms relfect the colors of love. 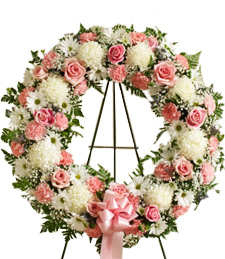 Send a beautiful tribute to that special someons and all their troubles will be forgotten. Blessings of Serenity reflect a time of cherished memories and good times. Forever hold peace and serenity in your heart for that special loved one in sorrow and loss for an open heart is always the best path to spiritual healing. 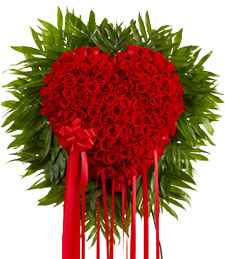 Stand by their side in difficult times and ease their Bleeding Heart with a gift of red roses to symbolize the love that lasts forever and beyond. 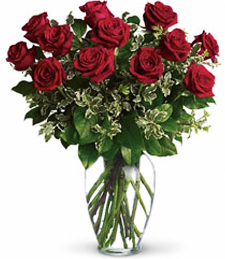 Give that special grieving someone A Touch of My Heart with a standing plethora of ultra shimmering luscious red blossoms that shine with love and hope. There is no greater gift than a simple thought to show your unconditional love and compassion.